Fresh from Round 4 of the 2018 Motul FIM Superbike World Championship, the Pata Yamaha Official WorldSBK Team completed a successful two-day private test at Brno ahead of the race weekend at the track in June. Both Michael van der Mark and Alex Lowes were in action on Wednesday and Thursday, as they focused on finding a good setup with their Pata Yamaha R1s around the 5.403km Brno Circuit, completing 346 laps between them. The Pata Yamaha team brought the weather with them from Assen, as the first day of the test was conducted in sunny and hot conditions. Day two saw much colder temperatures and some light rain at points but the cooler conditions led to an improvement in lap times around Brno as grip levels increased. Van der Mark wowed the fans at his home round in Assen with a double podium, finishing second in Race 1 and then crossing the line third in Race 2. The 36 points he collected saw him jump up to fourth in the WorldSBK Championship standings with 103 points and the 25-year-old Dutch rider is keen to continue the form that has seen him on the podium three times at the last three rounds. With this in mind, he used the two-day private test to find a good base setup with his Pata Yamaha R1 and work on his feeling with the electronics around the Brno circuit, that will feature on the WorldSBK Calendar for the first time since 2012. Completing 95 laps on Wednesday the 2014 WorldSSP Champion managed to get through 80 on Thursday to make it a total of 175 laps over the two days, and he now heads to Imola full of confidence. 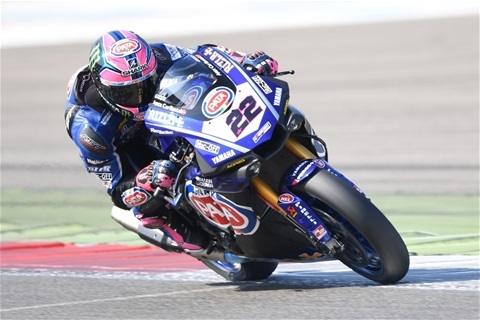 Lowes wanted to bounce back from a tough weekend in Assen and the Brno test gave him a chance to do just that. Determined to be back fighting for the podium in Imola, the 27-year-old British rider worked hard with his team over the two-days to find a good chassis setting with his Pata Yamaha R1 in an effort to improve his grip levels. He managed 88 laps on Wednesday and a further 83 on Thursday to get through a workload of 171 laps in total, as he, like his teammate, worked on his setup for the Brno race weekend and assessed some new suspension components. Lowes was happy with the work done and is now looking forward to putting it into practice at the next round in Imola. After back-to-back races and this private test, the Pata Yamaha Official WorldSBK Team return to action at Round 5 of the 2018 WorldSBK Championship in Imola on the 11th-13th of May.